In my guild there is a lady named Betty. She's been going to this guild for many, many years and has been reputed as the resident hand-quilter. Now she's getting quite up in age and is finding it difficult to do her hand work ... I can only imagine how heart-breaking that must be for her. A friend of mine had told me that Betty had been eying up my work for a few years now, watching how I do things, how my stitches look, etc. She knew the day would come that she wouldn't be able to do her own quilting and was looking for someone she could trust to do it for her. 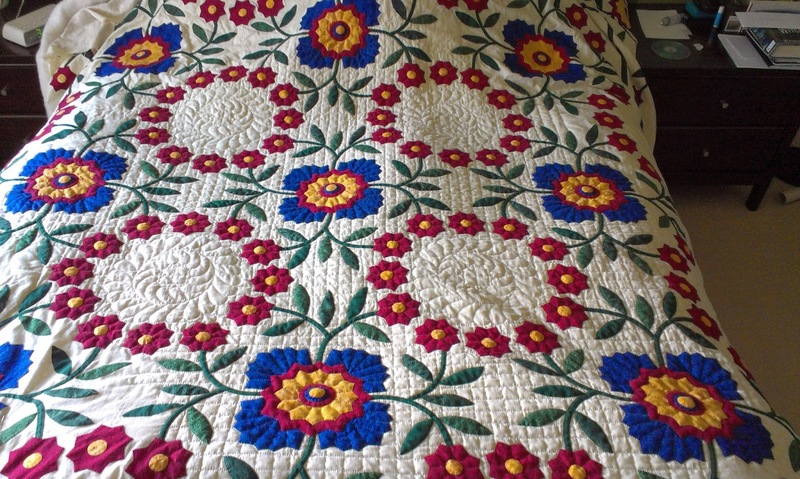 At our October guild meeting she approached me and asked if I would quilt for her. I have to admit I was/am pretty honored that she wanted me to do it, considering the reputation she has in the guild. 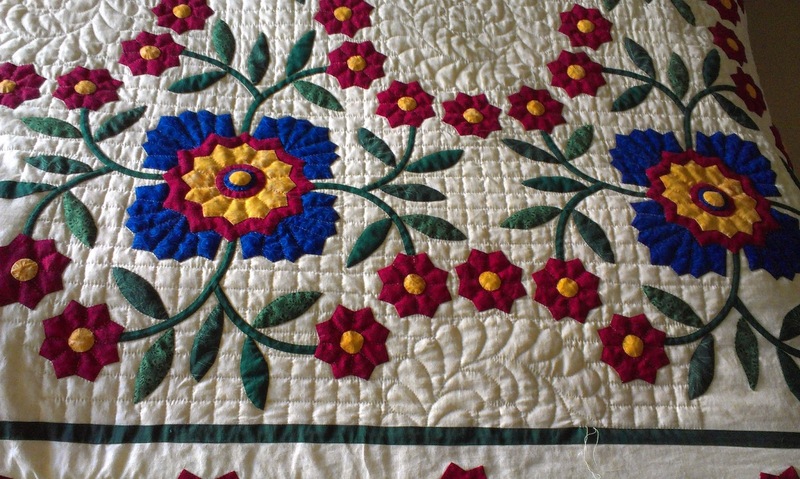 Her quilt is a queen size, all hand appliqued. Here's how it looks so far. I reckon I'm about 2/3 of the way done. I take pictures to update her on the progress every meeting. I'm hoping to be done it for our April meeting, but we'll see. Luckily she's not in a hurry for it, but I do want to get it done asap. It's funny though, how when I have no major projects going I can't think of what I want to do next. Yet when I have something big to work on that needs to get done I'm full of ideas of all sorts of new designs I want to get started. Anyhow, fingers crossed for April. Looking good so far!